It’s time to Skate, Battle and Roll! 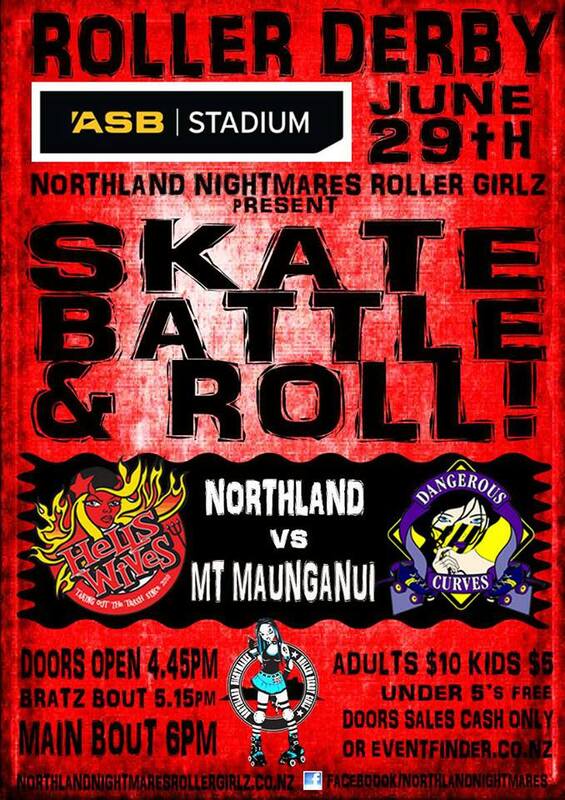 Northland Nightmares are stoked to welcome Mount Militia Derby Crew to Whangarei for the very first time for our annual rematch! With a win a piece, both teams are ready to skate battle and roll – so getcha selves along to witness some derby epicness on Saturday June 29th at ASB Stadium, Kensington! Doors open at 4.45pm, with a demo by New Zealand’s only junior roller derby team Northland Nightmares Derby Bratz at 5.15pm. Then it’s Hells Wives vs Dangerous Curves at 6pm! This entry was posted on June 7, 2013 by nnderby. It was filed under EVENTS! and was tagged with Hells Wives, Mount Militia Derby Crew, Mt Milita Derby Crew, Northland Nightmares, Northland Nightmares Derby Bratz, Northland Nightmares Roller Girls, Northland Nightmares Roller Girlz.